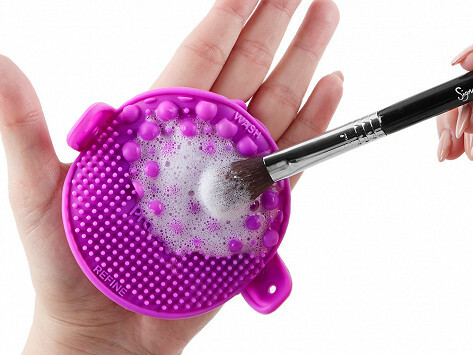 The Palmat can be worn on the palm of your hand for maximum control while cleaning your makeup brushes. The grooves deep clean bristles; swirl bristles along smartly designed grooves to deep clean hard-to-reach crevices. The bottom even has suction cups to secure it to sinks for more vigorous cleaning sessions. I got one for myself and one for my teenage granddaughter and we both like it. Small, so easy to store. Seems to clean brushes well. For a little gadget, it does what its supposed to. It really gets the brushes clean! Maker Sigma Beauty is an independent beauty company founded by husband & wife team Rene and Simone Xavier. With backgrounds in civil engineering and molecular biology, they were the perfect pair to identify an urgent need and design a solution. They want you to experience cleaner, better-performing brushes. After all, your face deserves it.